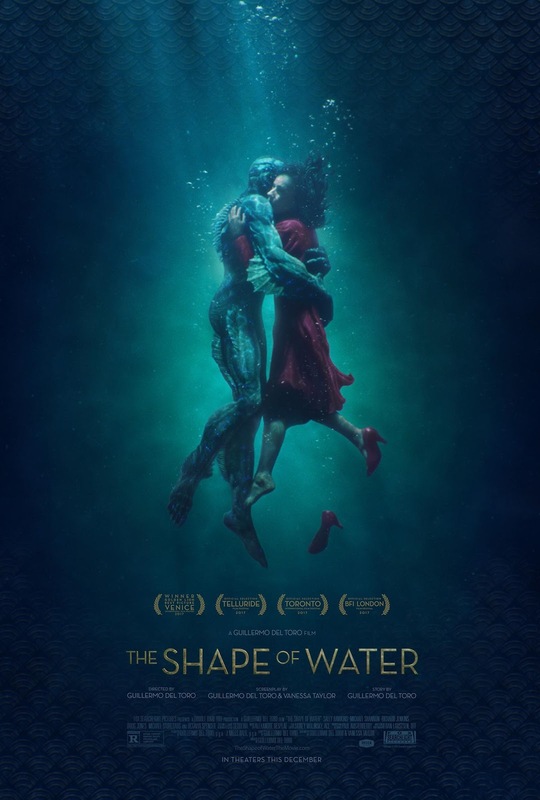 The Shape of Water was a culmination of many creative forces and it truly deserved all its 13 nominations at the 90th Academy Awards. The standouts definitely included production design, cinematography and original score, with Desplat having a strong chance of getting the gold. Desplat's score was so beautiful - romantic yet with a tinge of whimsiness that carried the theme of the film so well. And the long moments of silence also helped to fully appreciate the score. A shout-out also to the accompanying soundtrack. What great and fitting music choices! Dan Laustsen will have a tough fight in the cinematography section especially against Roger Deakins, Rachel Morrison and Hoyte van Hoytema (Lausten ties with Bruno Delbonnel for fourth place here). However, the cinematography really helped the production design to stand out as well as enhance the ethereal beauty of Hawkins and her love story. Kudos to Del Toro for having the vision and ensembling a terrific team to tell his story. He shared co-screenwriting credits with Vanessa Taylor and they both came up with a fresh way of telling a not-so-original-story. However, the film worked better during its silent (or music-paired) moments as some of the dialogue could be a tad too heavy-handed. And if not for the great actors of Richard Jenkins, Michael Stuhlbarg, Octavia Spencer and Shannon, they would have been even more clunky. This would be one category that it will unlikely get the Oscar for (Three Billboards anybody?). The acting throughout was phenomenon. Hawkins was simply wonderful throughout the film. She was enchanting, alluring, and a giddy mix of child-like amazement and womanly sensuality. She carried the film with her charisma and yes, her chemistry with Creature (Doug Jones) felt honest, sincere and real. If it was not for Frances McDormand - who had the bigger and showier role and character - Hawkins would have a real shot at winning the Best Actress award. Jones is the unsung hero of Del Toro's films (and Star Trek: Discovery) and even here, his portrayal of the Amphibian Man was key to selling the inter-species romance. It is not easy to emote in a latex costume, much less as a monster. But with his gangliness, Jones emote with his whole body and limbs to convey the creature's personality and emotions. As aforesaid, Shannon was truly terrifying (again) as the antagonist and was a great casting choice. Jenkins and Spencer were both nominated for Best Supporting Actor and Actress respectively and they were both good in their roles. Jenkins definitely had the bigger role and he brought depth and complexity in a character that could have been so easily caricatured, but William Defoe and Sam Rockwell will be his biggest competitors. Spencer, on the other hand, had a decidedly small role but she brought her usual ferocity and tenacity to a familiar - and overwrought - character. However, she too will be a long shot for the win with Allison Janney and Laurie Metcalf as front runners (and Lesley Manville as the dark horse). This film, with all its beauty - story, romance, aesthetics - seems likely to be the front runner to win the Best Picture award. And Hollywood sure loves films that celebrate itself (see: The Artist and Birdman). However, in my opinion, Three Billboards Outside Ebbing, Missouri is the film that should win for its intelligence, strong characters, superb mix of drama and humour, originality, and as a reflection of how the world views middle (read: Trump) America which is likely why there seems to be a backlash against it (it might just triumph at the BAFTAs).